Book Review — Atom Bomb to Santa Claus: What have the Americans ever done for us? 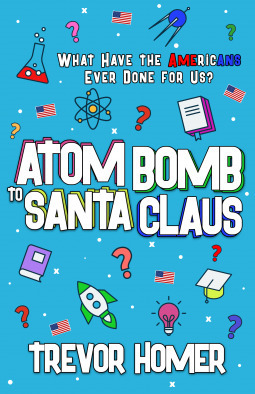 Atom Bomb to Santa Claus: What have the Americans ever done for us? by Trevor Homer is a look at the innovations and innovators of America. Homer is a British Amateur Champion golfer. He represented England seventeen times, winning the European Team Championship in 1973, and Great Britain and Northern Ireland eleven times. What makes bragging about the US something worth reading? Americans are taught about our country’s greatness all through their schooling. We have a president that preaches that America was great and can be great again. In this case, the author is British. I will say its nice to hear a foreigner talk about what the United States gave to the world without it being about the NFL and McDonald’s in a sarcastic tone. Not only does the book provide a balanced look at America for those in Britain, but it is also a good review for Americans. There are a variety of people mentioned in the book as well as inventions. Willis S Shockey invented the wind-up razor. The more familiar Schick used his military experience to make better shaving systems. Frisbees, canned beer, and beat poetry became the best things since sliced bread (also a US invention). The US became the Gold Standard, then did away with it making the dollar the world currency. A well-done history of sorts that reflects the lighter side as well as some trivial things that made significant changes in the way we do things. Nicely done.